Two way tour starting at Griebnitzsee station. 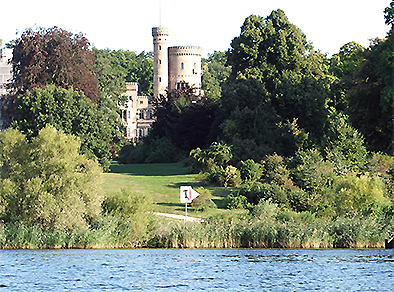 Discover one of the most mesmerizing areas of Germany: the palace, garden and lake disctrict between Berlin and Potsdam. This area is the climax of the German romantic landscape architecture of the 19th. century. Realised by the architects Schinkel, Lenné, Persius and Fürst Pückler. At the same time it is a place, where the history of the 20th century ruled and left significant traces. The Potsdam Conference with Truman, Churchill and Stalin, the dead zone of the Berlin wall and the exchange of the spies during the Cold War on the Glienicker Bridge. Enjoy the thrill between beauty and contemporary history. The booking up to 6 people make online here. For groups of more than 6 please send us an e-mail. Meeting point is the Griebnitzsee S-Bahn Station. Take the S 7 from Berlin (It runs every 10 minutes.). Our kayak station you will find in the station concourse. It does not take long to get to the first important building of our tour – the Truman House. The American president himself lived in this residence during the Potsdam Conference. 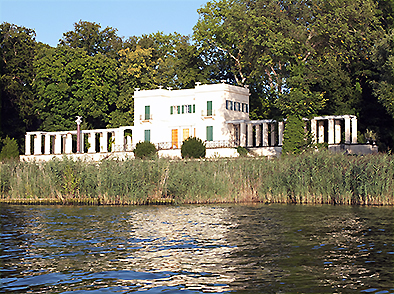 Host Stalin had evecuated all mansions along the lake in just a couple of hours before. The headquarter of the publishing house Müller-Grote thereby lost its seat and from this very house, Truman gave the orders to trop the nuclear bomb on Hiroshima and Nagasaki. Churchill and Stalin also took residence in two of the mansions. This picture shows the Churchill House, which was planned by Mies van der Rohe and is one of his earlier works. Later he became famous for his puristic style combining glass, steel, and stone. 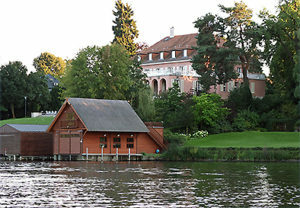 His very first building is close by, although not visible from the lakeside. The „Biergarten Klein-Glienicke“ is said to have been one of the biggest during the Kaiserreich (German Empire). Boats brought people to the never-ending beer fountains. 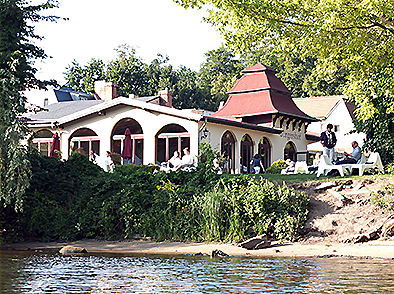 Klein-Glienicke became a touristic attraction with many restaurants and hotels. Until 1961. Surrounded by fences and so close to the border, it soon became a ghost town. Lately, the are revitalises. 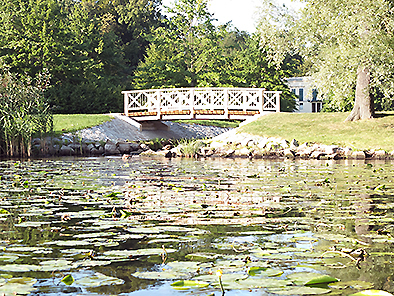 The park, where you will find the Jagdschloss Glienicke, yet again belonged to West-Berlin. The palace was one of the first in Potsdam. 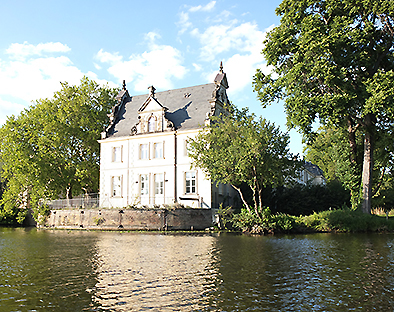 Friedrich Wilhelm had it built as a starting point for his hunting trips. It was his clever immigration policy, which later laid the foundation for the Prussian state. 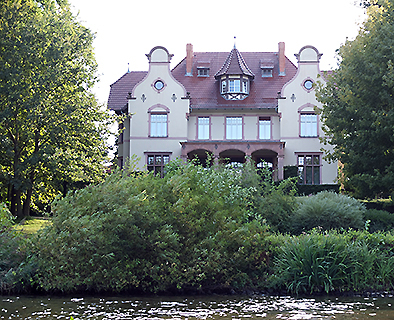 Above the River Havel, Palace Babelsberg is situated amidst of one of the most beautiful parks created by two famous landscape architects: Lenné and Fürst Pückler. Kaiser Wilhelm and his wife Augusta lived in this palace, which was built in the 19th century. It was a good thing that it is so big, since militant Wilhelm and liberal Augusta often had their arguments. 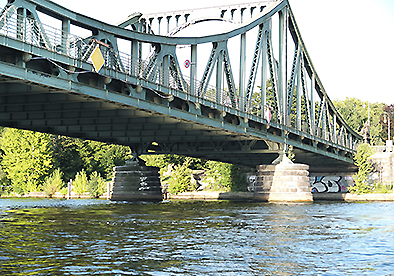 Besides Palace Sanssouci, the Glienicke Bridge is the landmark of Potsdam. Not the size or the architecture made it so famous, but its history. During the Cold War, the bridge was one of the border crossing points for the Allied, and later it was here, where spies from the East and the West were exchanged. Instead of mentioning all the smaller palaces, one more building should be pointed out: the Casino by Karl Friedrich Schinkel – it reminds one of Italy, and this was also the intention as with many other buildings in Potsdam. Originally it was supposed to be a guesthouse for the already mentioned Jagdschloss Glienicke. This marks our turning point, from where we head back to our starting point at Griebnitzsee railway station. Beside all architecture and history, a beautiful landscape awaits us – be it in planned (see picture) or natural ways as one will see on the Northern side of the lake.